PH stands for Potential Hydrogen. All Hydroponic nutrient solutions need to be kept at the proper PH if they are to be used by the plants. There are many types of Hydroponic garden systems available for retail purchase. RGJ Power offers you many choices in Hydroponic systems to purchase. The basic principles for all the different types of Hydroponics systems are basically the same with just slight variations. In all Hydroponic systems the common idea is to get the nutrient solution from point A to point B - point A being some kind of reservoir holding area for the nutrient solution and point B being the plants being grown. In many cases the nutrient solution actually goes from point A to point B and then back to point A again. The choice of any Hydroponic system would be highly dependant on what is being grown and where it is being grown. That would logically lead us to the conclusion of how it should be grown. Ebb and Flow Hydroponic systems are probably the easiest and most highly used Hydroponic systems used today. Again, the Hydroponic system that is used is determined by what crops are being grown. In an Ebb and Flow Hydroponic system the crops grown are usually smaller or shorter or not too big around such as lettuce or leafy type crops. That is not to say you could not grow larger type plants in this system because you certainly could. They would grow very well. You would just need to set up things a bit different for the larger plants to deal with the reaching, harvesting and replacing of the plants. On a commercial level Ebb and Flow Hydroponic systems are usually used to grow smaller size plants so as not to have to deal with the added work involved with taller plants. Ebb and Flow Hydroponic systems work on a very simple principal. A nutrient solution reservoir or tank is usually located below the growing area. Nutrient solution is pumped up to the water holding growing table above to feed the plants. The table is slightly sloped so that the nutrient solution runoff goes to a drain and then returns to the tank below where it originated from. That's it. Sometimes the flow is constantly on and sometimes it goes on and off with a timer depending on what is being grown. Lettuce and other crops can be grown floating in water like in a small lake if enough oxygen is introduced into the water. Many crops are grown in pots with a growing medium and flooded every few hours or every few minutes depending on the growing medium being used. Growing mediums are discussed as a separate topic elsewhere on this site.Ebb and Flow Hydroponic systems are great for hobby setups and for indoor growing as they are easy to build and can be made in any number of sizes. There are several other designs of Ebb and Flow Hydroponic systems using the same principles as the traditional Ebb and Flow systems. In this Hydroponic system design a 55 gallon drum is used for the nutrient tank. The nutrient solution is pumped out of the drum and into the bottom of the pots flooding the pots up to the correct height feeding the plants. The timer then pumps the solution back into the drum when the correct designated time has passed. Hydroton is used as the growing medium here. This system takes up some space but pots can be added or removed at any time and some very large plants can be grown utilizing this Hydroponic system that would be rather difficult to grow with any other Hydroponic system such as with NFT systems or above the ground in a water table setup. Many commercial growers as well as hobbyists use the NFT Hydroponic system. A NFT or Nutrient Film Technique Hydroponic system normally utilizes a channel or many channels like gutters or gullies with a continuous flow of nutrient solution running inside along the bottom surface of the channel. This makes a very shallow constant flow of nutrient solution available to the plant roots. There are usually equally spaced holes at the top of the channels for placing the young plants into with the roots hanging down and touching the solution. 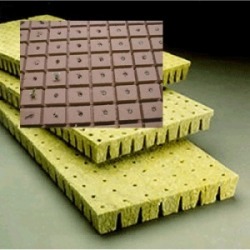 Plants for this type of Hydroponic system are usually started in Rockwool plugs and then transferred into the holes at a certain age and left there to grow to maturity. Many different types of smaller to medium plants and vegetables can be grown in a NFT Hydroponic system. Some space is needed for this type of Hydroponic system as there are usually many floor supports involved mounted on an angle so the water flow is on an incline and can return to the reservoir underneath. No growing medium is required for this Hydroponic system other than the Rockwool cubes the seedlings were started in. Top feed or Top irrigation drip type Hydroponic systems are also very versatile systems in the ways they can be used and the wide range of crops that can be grown. With this type of Hydroponic system nutrient solution is pumped to the tops of the plants through small drip hoses and flows from the top of the pot or growing area through to the bottom. If the Hydroponic system is set up with a tub or catch basin with a drain line the solution can return to the reservoir and be recirculated through the system. Many commercial operations as well as many hobbyists use this type of Hydroponic system to grow many different varieties and sizes of plants. Larger pots and 3 to 5 gallon grow bags can be used with this type of Hydroponic system to grow large cucumber and tomato plants as well as nursery shrubs and even trees. Larger plants such as these are usually placed on a gravel base on the ground and the nutrient solution is lost into the ground and not recirculated. Smaller plants that can be spaced closer together and possibly placed on a water table are usually using the recirculating Hydroponic system. The small feed hoses are usually staked inside the pots or if hydroton is used water drip rings are just set on top of the growing medium. The Aeroponic Hydroponic system is very different from all the rest of the Hydroponic systems while at the same time basically the same principles are going on. The plants are suspended at the top of an enclosure with their roots hanging in mid air inside the enclosure. The hydroponic solution in the reservoir is pumped to small very fine mist sprayers under the roots spraying upward toward the root showering them with fine nutrient spray. The advantage here is that the fine mist sprayers also collect lots of oxygen and direct it to the roots making the plants grow extremely fast. The nutrient solution is then recirculated to the reservoir. No growing medium is needed in this type of Hydroponic system other than what is supporting the plant at the top of the unit. The disadvantage with this type of Hydroponic system is that some fine mist nozzles get clogged over time with deposits and then do not function properly. Some Aeroponic systems have been designed with spinner type sprayers that, although do not create as much of a volume of oxygen at the root zone, do not clog up requiring constant maintenance by the grower. If the bugs in the sprayers can be worked out plants grow like crazy in these types of Hydroponic systems. Hydroponic nutrients are the life blood of any Hydroponic system.